3.4 4. Do You Have Copies in Inventory? 8.3 Everything Is Now No-Mod by Rez2! Rez2 allows you to easily package, rotate, move, align, and sell big or sparse structures that may be impossible to link. The speed is greatly improved over Rez-Free, allowing your builds to be rezzed even faster! NEW IN REZ2: Faster rezzing! See the demo video below! It's FREE! The Free version contains all the features you would expect from other commercial package rezzers. Temp-rezzing support. With mesh content this no longer gives any advantage over regular rezzing. Rezzing across region borders. This wasn't reliable due to sim communications. The Rez2 anchor object has only ONE face. You cannot re-texture just the box portion without also re-texturing the arrows at the same time. There is no texture template for the Rez2 at this time. You might find it easier to just make your own anchor object. You can (but it's not required to) make a customised anchor! Simply "Open" and "Copy to inventory" the scripts in the default anchor. In your inventory you will then find a folder with the "Anchor" and "setup" scripts. Simply create (or rez out) your desired anchor object, and drag those two scripts from your inventory, into your object. Now you are ready to proceed with the step-by-step, beginning with the next section below. Rez your build somewhere it can stay while you're packing it. Link together as many parts as you can, or as is efficient for your construction method. The fewer linksets/pieces, the less time it takes to pack. Set your permissions on each linkset/piece, while they are rezzed inworld. Before you begin to pack it, right-click > "take a copy" of the entire build. This gives you a backup copy of the base build in your inventory in case of "Oops!" 1. If this is your first time using Rez2, rez out and unpack your Rez2 shipping crate to get the Anchor and the Rez2 Tracker script in your inventory. 2. Drag a Rez2 Anchor from your inventory to the ground. 3. Rename it to something distinctive, and appropriate for the build. 5. Drop a Rez2 Tracker script into the root prim of each linkset of your build (Just the regular "Rez2 Tracker" script for now. For info on the other available tracker script options, see Tracker Script Options). 8. Repeat steps 5-7 for each additional linkset in your build. (name of linkset): I'm now associated with anchor '(name of anchor)' (uuid string). You can touch me for a menu to reassociate if you wish. 10. You will see green hovertext on the linksets/pieces saying TRACKING! and chain particles. 11. If you don't see any particles, make sure you have particles turned ON in your viewer, and that your particle slider in your viewer's graphics preferences has a number greater than "128". Repeat the above steps for each linkset you want tracked with that anchor. 1. Move the anchor a sufficient distance away in order to see if you missed tracking any linksets/pieces. 2. If you missed one or more pieces, simply "undo" the move (CTL + Z) to send the anchor back to its original position. 3. Then repeat the steps in section packing your build for each linkset/piece that was missed. 4. Once all the linksets/pieces are properly tracking, right-click > "take a copy" of each linkset/piece into your inventory. 7. Once you are done, the anchor should have ALL the pieces in its contents. 8. "Take a copy" of the anchor. This is another backup in case of "Oops!" 4. Do You Have Copies in Inventory? At this point you should have a copy of ALL of the linksets/pieces and the anchor you are working with in your inventory. If you do not, go back and "take a copy" of them! 1. Once you've taken copies in your inventory, you can delete the objects inworld. 2. 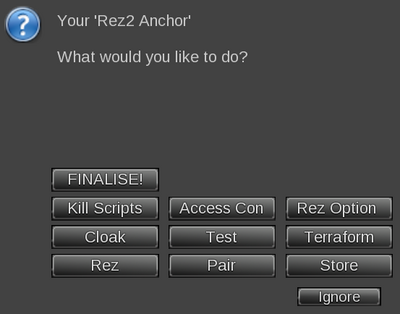 Once everything is gone, click the anchor again and select "Rez". 3. Everything should appear in place, relative to the anchor's position. 4. If you're satisfied with the position of all the pieces, then click the anchor and select DEREZ from the popup menu. 2. On the popup menu, select "FINALISE". This will make the anchor transferrable and will also "lock" the positions of the linksets/pieces and prevent further adjustment. The anchor is now ready to be either sold or given away! * Rez2 Tracker (No Text/Particles) - Use this if your build has existing floating text that you need to preserve. If you just want to hide the text and particles, use the regular Tracker script in "Cloak" mode. * Rez2 Tracker (No Touch) - Use this if you don't want the "Unpair" dialog to show when you touch a tracked piece. Note that the dialog only shows while the rezzer is active, it goes away once the build is Finished. * Rez2 Tracker (No Text/Particles/Touch) - Combines the two options above. WARNING: If you use the "No Touch" scripts, you will be unable to unpair items from your anchor via the menu. Instead, you should reset the tracker script, which will unpair it. This option deletes the "setup" script, and makes the anchor transferrable so you can now sell or give away your build. This also prevents adding or adjusting pieces - the anchor will no longer accept new data without the setup script in it. This option removes ALL scripts in all of the pieces. You CANNOT undo this action! If you just want to remove the green "TRACKING...." hovertext, use the CLOACK option instead. Owner is the default setting. See this section for details. This removes the green hovertext and particles, but does NOT remove scripts. This allows you to move things around without seeing distracting particles or hovertext. If you are satisfied with the placement and no longer wish to move the build, you should always use "kill scripts" or "finish". This option moves all the tracked parts up about 10 meters for about 10 seconds, then moves everything back down. This allows you to see if there's any parts that you missed putting a tracking script in. The terraform option only lowers the terrain to a point where the objects can move to the correct position, that's all. Any further terrain adjustments need to be done by the avatar rezzing the build. YOU must have "Terraform" ability on the land in order for this to work. This is a toggle option - when it's on, moving the build into the ground will roughly terraform (the ground will sink) as you move the build into place. Click again to turn the Terraforming option off. (Usage: Click the Rez2 anchor and select "Terraform" from the popup menu. In local chat you will get the message: Build will now lower land when appropriate. This means the option is now ON. Lower the build. When the center point of the lowest root prim out of the linksets hits the ground level, the ground will begin to sink below the build. The area will expand as each additional root prim hits the ground level. Toggle it off and finish positioning the build when satisfied with the depth of the terraforming effect. Raising the build will not undo the terraforming - that will need to be done manually, along with any fine-tuning / cleanup of the existing terraforming. To rez and derez the build. This option writes the current position and rotation of the linkset in the object description field, as well as killing the scripts. The position and rotation numbers written into the description field is a "backup" of sorts - occasionally Second Life moves things out of place; sometimes people refer to this as "prim drift" - having these numbers in the description field will allow you to input the appropriate numbers for position and rotation for the linkset via the edit window to move the linkset back to its proper place, rather than trying to slide it with the arrows in edit mode. 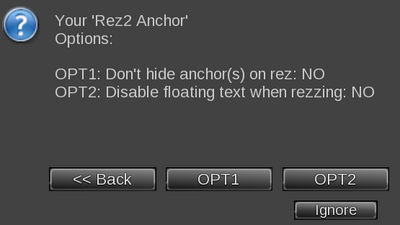 This setting only matters when the anchor is rezzed from a vendor. When a customer rezzes the anchor, the anchor will always be visible. This applies ONLY to the anchor itself - the pieces/linksets will still rez FROM the anchor with the usual tracking-related hovertext. See the Cloak option to hide text from the rezzed pieces/linksets. If you did Edit > Delete on items rezzed inworld, they should still be in your trash. If you did Edit > Contents tab > Delete on contents of an item, no you can't get them back. If you put the tracking script in all the parts, then did Derez BEFORE picking up copies and packing it in the anchor, no you can't get them back. This is why the instructions explicitly have a step where you "take a copy" of everything BEFORE you hit derez. This happens when you attempt to rez a physical object larger than 64m (in any axis), and there is an avatar in the way. 5 //  Sets object phantom until after rezzed and moved into place. Compatible with Rez-Free, Rez2, Holovend. Everything Is Now No-Mod by Rez2! Actually, no it didn't render everything no-mod - LSL scripting does not even have that capability. This has the unfortunate side effect of making ALL contents have the lowest available next-person permissions. Since the Rez2 scripts are no-mod.....everything becomes no-mod. 3) Click the anchor again, select "kill scripts"
7) Begin re-packing your build. If your rezzed object will be rezzing poseballs (like for synced beds), props or other parts, you will need to put this script in each additional item to make sure they clean up after the rezzed object is removed from display. This occurs when you link stuff together AFTER adding the script. The root cause is simulator bug BUG-139237. There is now a "fix" included in the crate, the script is called "z_Fix for BUG-139237". Simply drop it in the root prim of the linkset and it'll ask for link permissions - grant these permissions and it should fix the build. You can manually fix your builds by unlinking, removing the script, linking your build back together, then re-adding the script. This is effectively what the "fix" does anyway. To avoid hitting this issue in the future, just add the script AFTER you've linked everything together. The primary reason hovertext will not respond to a "Cloak", "Finish" or "Store" command is that the script is simply not there in the prim with the hovertext. Hovertext will always be there ("persistent") until a script tells the prims/linkset to clear it - if there's no script that handles hovertext IN that linkset, then the hovertext will stay until it is scrubbed by a different script. If you have this situation come up, you can use this script in EVERY linkset that needs to have the hovertext cleared off. This script will only get rid of the hovertext and any particle beams - no other scripts in the linkset will be deleted. 2   //Public Domain, use as you wish. No license terms. "inventory creation on in-world object failed"
This is a message from the SL grid, not Rez2. That message simply means you tried to move too many things at once into the anchor contents. You'll need to delete the pieces that you already put in there, and then drag over a few pieces at a time from your inventory. 15 or less at a time normally works, even when the grid is being terrible that day. This is a pathfinding error message, and comes from SL itself, NOT the Rez2 script. Currently the Rez2 cannot track objects that are set to be part of the pathfinding navmesh. Most common linkset issues are likely to be ones that contain any full-perm build components that were purchased from someone else, such as mesh items. Such items may have had "pathfinding" accidentally enabled for the item before sale. You will get a HUGE popup, which -should- automatically have your selected linkset highlighted. Change the attributes (bottom left) to "Moveable obstacle"
Repeat with all other errant linksets, if any. When done, close out of the pathfinding popup. Replace the Rez2 tracker script, and the prims should track properly now. You missed clicking "Finalize" before you picked it up. Just rez the anchor out again and hit "finalize" and it'll be all set. The fastest way to sort out which linkset(s) is/are the problem is to go into edit mode on the anchor, go to the "contents" tab, move the bottom scrollbar to the right, and see which one shows up as "(no transfer)". That tells you which piece you need to start looking in when you rez it to find the thing that shouldn't be there. Second Life displays the MINIMUM available permissions when an item is in your inventory. This by design of Linden Lab, and not something Casper can change. Because the Rez2 scripts are no-mod, your finalised product will always appear at least no-mod while in your inventory. Permissions on the object(s) themselves should display as intended once they are rezzed inworld, provided you have not used the "permissions" button on the object inventory contents. Q. I "pair"ed an item with an anchor, then accidentally un"pair"ed it, and I re"pair"ed it with the same anchor, but now it gives me "I wasn't rezzed by a script" message, and won't delete. A2. Remember to make sure there's a copy of the linkset in the anchor you want it in, before using derez. Q. I'm setting up a build with the Rez2 but the prims are either saying "searching for anchor" or "TRACKING!" but I don't see any particles! A. Wrong script: This happens when you use the Rez-Free tracker script with a Rez2 Anchor. The prim is not being tracked, which is why you don't see particles. Q. I packed everything in the Rez2, but when I test rez, I see this kind of message over the Anchor - "3 parts remaining: rez queue 0" - and/or nothing is rezzing where it should be! A1. You don't have the Rez2 Tracker script in the objects you're trying to rez. A2. You have the wrong script in the pieces you are rezzing (or no script at all). Commonly this is the Holovend Tracker script in there by mistake. Take out the wrong script and replace with the one named: "Rez2 Tracker". Q. I packed a build in the Rez2 but when I rezzed it, the doors came out crooked / floating at an angle. Help! * Did any parts rez off-world / off parcel boundaries? * Do the doors actually have the Rez2 Tracker script in them? * Were the doors in a closed state when you packed them? Some door scripts are finicky - try making sure the doors are closed, reset the door scripts, and try a fresh tracker script again. A. Are you adding a third party (non-CasperTech) script to the Rez2? If so, you may have a conflict between one or more commands in the extra script and the Rez2. Example third party scripts would be door or "whole house system" scripts. A. You used a holovend tracker script by mistake. Take it out and use the actual Rez2 tracker script instead. "uuid" may be NULL_KEY unless required below. 10001: Rez. Will send response code 11001 when done. 10002: DeRez. Will send response code 11002 when done. 10003: Show menu dialog. Pass the avatar key as the uuid parameter. 10014: Is build currently rezzed? Responds with a RESPONSE CODE as defined below. This is to provide compatibility with third party scripts. This page was last edited on 4 August 2018, at 21:06.